Tanning beds used according to the manufacturer’s instructions expose the user to health risks, including melanoma and other skin cancers. 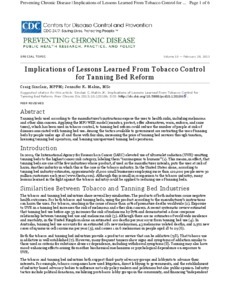 Applying the MPOWER model (monitor, protect, offer alternatives, warn, enforce, and raise taxes), which has been used in tobacco control, to tanning bed reform could reduce the number of people at risk of diseases associated with tanning bed use. Among the tactics available to government are restricting the use of tanning beds by people under age 18 and those with fair skin, increasing the price of tanning bed services through taxation, licensing tanning bed operators, and banning unsupervised tanning bed operations.